Someone told us on our first Dîner en Blanc at the Louvre and Tuileries (a location what was repeated tonight for some guests), that it never rains for the event, and this year was no exception. At 5pm, as we prepared for our fourth year at the Paris Dîner en Blanc, the sun peeked out of the sky. Rain and clouds threatened all day, replaced by sunshine, seemingly just for the event. It’s a special year, marking the the 25th Anniversary of this pop-up dinner phenomenon that began humbly as a reunion when François Pasquier returned to France after living abroad. Now in 18 cities, the magic has spread worldwide, as far as Rwanda, Haiti, Australia and many cities in the United States, including New York City. 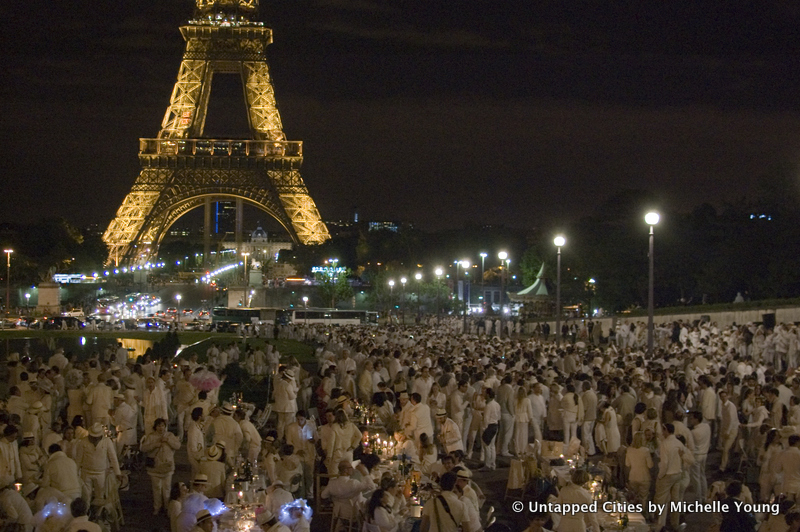 Tonight, the Paris Dîner en Blanc took place in two locations: at Trocadero, with a majestic view of the Eiffel Tower and at the Louvre. In Paris, travel is coordinated both by bus and by foot, but mostly via the buses. The bus location is sent a few days before the event, but we usually don’t know the actual location of the dinner until sometime when we’re on the bus. Halfway there tonight, our bus leader told us that we were headed to Trocadero, one of the last locations in Paris where the Dîner en Blanc has never been yet. It was incredible to see Parisian society once again get down across generations. Like the Dîner en Blanc at Notre Dame and Place des Vosges, there was a distinct message that the event was being passed to the next generation who would continue the tradition and retain its relevance. At its root, the Dîner en Blanc can only perpetuate if it retains the purity of spirit in which it began: just a place to share a beautiful moment in time with others. And in that vein, not only was there an epic dance party at Trocadero, there was a genuine mix of societies and cultures because of the very public location, something that doesn’t always happen within this particular set in Paris. Not everyone may have noticed, but this was likely a turning point in the history of the Paris Dîner en Blanc. There is a new future for Paris–and the forefront may be at this beautiful event. Did we mention there was a DRONE filming at the event last night? Check it out here. See more photos from previous Dîner en Blanc in Paris Tuileries, the Louvre, Notre Dame and Versailles, New York City and Boston. Check out the documentary about the Dîner en Blanc, screening this Sunday for press only at La Pagode Cinema in Paris. Special thanks to one of our favorite bloggers Messy Nessy Chic for spreading the word about the dinner tonight and the documentary! Great article, great photos, I can’t imagine anyone reading this not wishing that they could have been there too! finally i found the article that event deserved! i enjoyed it! Thank you! Really appreciate the nice comment!